In our commitment to environmental issues, Yokohama Chukagai Parking Cooperative promotes the following. 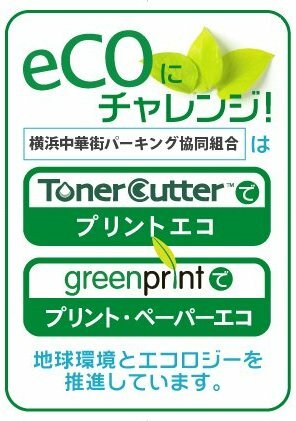 ● Use of ECO software in the office and reduced use of ink and toners. ● Use of 100% recycled paper for operations in the office, such as copies and business cards. ● Reduced use of water and electricity. ● Guests are encouraged to stop idling while in the parking lot. ● Use of toilet paper made from recycled paper. Product provided by　RCI Front Net Inc.
© 2014 Chukagai Parking All rights reserved.